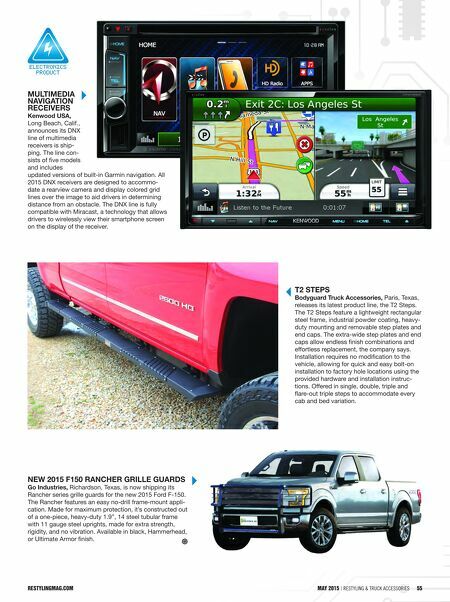 restylingmag.com May 2015 | Restyling & tRuck AccessoRies 55 restylingMag.coM May 2015 | Restyling & tRuck AccessoRies 55 MULTIMEDIA NAVIGATION RECEIVERS Kenwood USA, Long Beach, Calif., announces its DNX line of multimedia receivers is ship- ping. The line con- sists of five models and includes updated versions of built-in Garmin navigation. All 2015 DNX receivers are designed to accommo- date a rearview camera and display colored grid lines over the image to aid drivers in determining distance from an obstacle. The DNX line is fully compatible with Miracast, a technology that allows drivers to wirelessly view their smartphone screen on the display of the receiver. 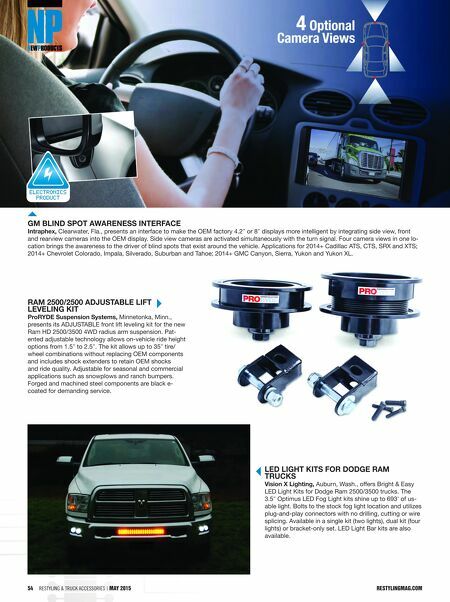 ElEctronics Product T2 STEPS Bodyguard Truck Accessories, Paris, Texas, releases its latest product line, the T2 Steps. The T2 Steps feature a lightweight rectangular steel frame, industrial powder coating, heavy- duty mounting and removable step plates and end caps. The extra-wide step plates and end caps allow endless finish combinations and effortless replacement, the company says. Installation requires no modification to the vehicle, allowing for quick and easy bolt-on installation to factory hole locations using the provided hardware and installation instruc- tions. Offered in single, double, triple and flare-out triple steps to accommodate every cab and bed variation. NEW 2015 F150 RANCHER GRILLE GUARDS Go Industries, Richardson, Texas, is now shipping its Rancher series grille guards for the new 2015 Ford F-150. The Rancher features an easy no-drill frame-mount appli- cation. Made for maximum protection, it's constructed out of a one-piece, heavy-duty 1.9", 14 steel tubular frame with 11 gauge steel uprights, made for extra strength, rigidity, and no vibration. Available in black, Hammerhead, or Ultimate Armor finish.